CLAMF Competition 9th December.. Classic FAI, Vintage A T/R & Classic B T/R... Get down to CLAMF ! CLAMF Competition 26 & 27th January 2019... Club Day !! CLAMF Competition 10th February 2019... Sport Flying Day .. anything goes ! One of the “black arts” of racing glow plug engines is the formulation of fuel, with recipes closely guarded by the associated SSFK, “Secret Society of Fuel Knowledge”. I’ve been trying to get to the bottom of this art since the 1960s, when I first started racing B team racers with my trusty ETA 29 6c and some rather radical and highly unsuccessful flying wing designs. However I digress; back to the fuel story. What fascinated me as a budding organic chemist in the ’60s was the myriad of individual fuel ingredients used to power B T/R engines. I have since collected many articles on fuel formulation. 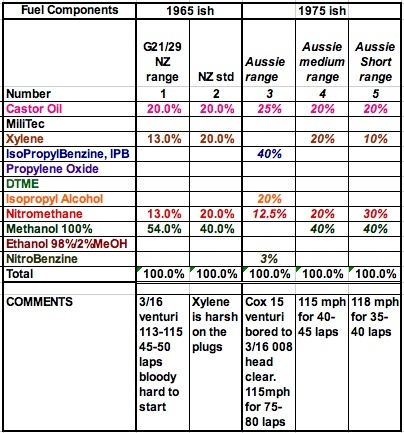 The winning formulas included various combinations of some or all the normal stuff: isopropanol (IPA), benzene, toluene, xylene, nitromethane and nitrobenzene (see Table 1). They also included such real exotics as “orange oil”(d-limonene), detergent oils, cumene, benzol, water, petrol and dinitromethane, just to name a few. I think some racers were only flying for the smell! Then there was the “swear by” brigade; those who swore that no-one would ever get anywhere near the podium unless they used this or that impossible-to-get exotic ingredient (a bit like F2C today!!). I do remember a very new B T/R pair who simply got hold of the best engine at the time (a ST21/29 RV) in fairly standard form, and concentrated on teamwork and a simple fuel of IPA and methanol. They managed to blitz everyone with speed, range and excellent restarts. (“Funny,” I thought. “Isn’t that the holy grail of B T/R?”). They came unstuck really badly during the finals at the North Island Easter Champs of 1969 when the losers got together and had them thrown out of the competition for whipping, on the premise that they must have been whipping, because they were going so fast! They were of course stunned by their expulsion, and were never seen in the team race circles again. I somehow ended up with their motor. Bad sportsmanship of the time aside, their approach taught me an important lesson. “To go fast, boy, concentrate on a good model, a good engine and good teamwork.” To hell with the exotics, simple is best.“Where is he going with this?” you may well ask. However, taking this lesson into account, I searched around for the fuel element in this multi-vectoral solution to winning an event, thinking the other elements will come with practice and a good engine builder. 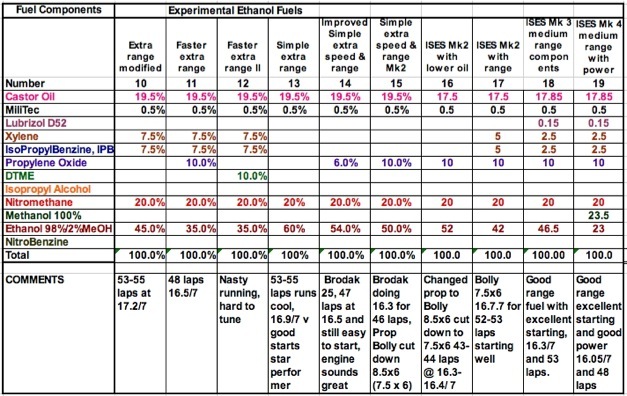 When looking at formulations, one has to take into account changes in engine design. The old-fashioned, long-stroke, cross-flow, slow-revving, low-compression-ratio engines of the 1960s and ’70s could swing a much larger prop on much higher levels of aromatic hydrocarbons than our modern, high-compression-ratio Schnuerle/boost ported ABN and ABC short-stroke, high-revving technological marvels of today. 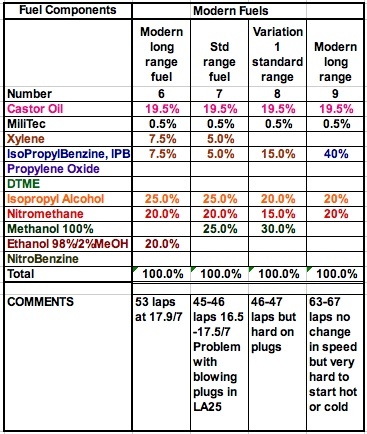 After several years of intensive fuel ingredient testing, with few successes and many failures it became very apparent that modern engines are very touchy when it comes to changing their feed composition (see Table 2). The more one adds of ingredients for range, the more laps one gets; but engines tended to overheat and become hard starters as the level of aromatics (xylene, toluene and benzenes) and complex alcohols (IPA) goes up in the formulation. I have proved that one can do 67 laps on 45% isopropyl benzene (IPB, or cumene), but when the engine stops it’s very hot and stays stopped. Also, a modern T/R engine running on 45% IPB is much more critical, whether starting cold or hot. The inside of the combustion chamber goes black. It’s hard on plugs and it hard on wrists. Toluene, benzene and xylene behave in a similar manner, but engine tuning is far more critical than on IPB. Lowering the aromatics results in improved starting and reduces the lap gain, but more than 10% aromatics in the fuel composition causes things heat up and start to become quite difficult. When researching fuel, I discovered that benzol is not simply benzene as I thought, but coal distillate, very commonly added to petrol in the 1940s and ’50s. It is a natural fall of xylene and benzene—about 50% of each—and was a very common solvent once. “Why is this important?” you say. Well, in the old days we used benzol as a fuel ingredient in B T/R and it worked very well. John Hallowell and I found that an equal mixture of xylene and IPB works better as a range ingredient that either IPB or xylene alone at the same level. It’s called synergy: where the effect of the mixture is actually greater than the sum of the individual effects. One can use less and still get the same effect. Less heat means less carbon and more laps. Upping the IPA slows the laps, but you do get more of them. You can just run on just IPA with 15% nitro, but it takes all the engine’s power away. Starting does not seem to be a problem, but it runs cold and the needle setting is very insensitive. Taking the stopwatch as the final arbiter (a very fine and completely scientific saying from Robbie Hiern), the more you add the slower you go. This is a simple situation here; more nitro means fewer laps. At more than 15% nitro there is no apparent gain in power, just unburned nitro and more laps lost. The reason is simple: nitromethane burns relatively slowly in the combustion chamber, and in modern, high-RPM engines there is not a lot of time to fully burn up nitro at levels over 15%. Upping the level beyond this point gives no advantage. You could try raising the compression to take advantage of the extra nitro, but this seems to “make everything go supercritical”, as the nuclear boys say. So, after all the hours of testing with many different fuel brews, what is the answer? One can use the synergy of added ingredients and get quite a satisfactory fuel. A mixture of 20% castor oil, 15% nitro, 2.5% IPB, 2.5% xylene, 20% IPA, a glug of Lubrizol 52 and the remainder methanol will produce a good starting-range fuel that seems to be great for 46–7 laps. Play around with upping the IPA and reducing nitro a little bit and you may get 52–3 laps. A tiny slug of water (1–2%) can help keep things running cooler. However, make sure you tune for the day. The interaction between fuels and motor is very sensitive to changes in temperature and humidity, and we have found that we can get 48 laps on this fuel one day, but on others we are scratching to get 43. Now what is the ultimate secret? There has got be one here, otherwise I would not be writing this article. Look at the problem another way. What happens if we pull some of the ingredients out of out hard won formulation? First, take out the IPA. What happens? Laps go down a little and lap times also go down. No problem getting at least 36–8 laps at 16.4–16.5/7. Next, pull out the IPB and xylene. Lap times go down to 16.2/7, but the number of laps per tank goes down too—to 33–4. That’s not good. You need at least one full lap on the glide per tank to get through a race. However, it proves that the aromatic derivatives actually have the single most effect on laps and the least effect on speed. Lesson one: it’s probably a good idea to get rid of the IPA if you want a fast heat time. But how do we get rid of the aromatics? They are robbing power too. There is a solution and it requires a radical rethink. Since the cane farmers in Queensland have received a government subsidy for making ethanol as a fuel, Bunnings has been selling a super-cheap methylated spirits that is 2% methanol and 98% ethanol. In a very radical move I decided one day to try the meths. It’s a higher alcohol, so it should work in place of methanol. I made up a standard mixture of 15% nitro and the rest Bunnings’ ethanol. I fired it up one day on the flying field on the MRS LA25 and it shocked me by springing to life instantly. The setting, left over from the previous week’s B T/R practice, was quite rich; it tuned well and I let her go. Well, it did 46 laps at 17.1/7 on the first try. It was still running rich. A refill, another instant restart and a retune delivered 16.9/7 for 48 laps. After a few weeks of playing around, I could get 16.5–16.6/7 for 46 laps on 20% nitro. I used the formula to get into the National finals. With a little bit of a lean tune and an even luckier change in the humidity on the day, those 46 laps turned into 52 for the finals. Now I had a simple formula, no IPA and no nasty aromatics, and it has given laps and good lap times. “Where to now, Lance?” you say. Time for me to retire from the Holy Grail of fuel quest? Naah! As Apple Computer says, resting on one’s achievements is actually going backwards. So forwards we go. Bunnings’ meths is an excellent range and power fuel; it’s pure alcohol, its cheap and it works. So what can we do to improve it? It’s a little down on power over methanol, but that’s not too significant. The oxygen level of the final fuel is less than with methanol, but that’s why we are getting the extra laps. Adding a little more nitro and a dash of some propylene oxide to help burn up the extra nitro actually does not decrease the laps (going to 20% nitro seems OK), but don’t expect more than 45 laps at a reasonable speed. The mixture will handle a leaner tune but lap times get slower as laps go up. Adding a smidge of IPB and xylene will get the laps up with a minimum of trouble and set you up for the 2-stop finals. Just a warning, adding the aromatics means much leaner tunes are possible but the chance of an engine burn-up also increases. Remember to use some detergent, such as Lubrizol, in the fuel to combat the smoky deposits that come with xylene and IPB. We have also discovered that extra power can be obtained without the loss of too many laps and with no effect on restarting by the substitution of a equal volume of a 50/50 mixture of ethanol and methanol in the place of just ethanol. This mixture can be used in the heats, and for the final one can elect to go back to a ethanol only fuel. The simplest modification we twigged too was to add a new Nelson “Hotter” plug to replace the HD plug in this Ethanol fuel combination. The significant improvement in RPM and the disappearance of the cold running misfire in the first few laps made this simple modification more than worthwhile, however the jury is still out on the plug life using a hotter plug, and it pays to change them out for a fresh plug before any important race. Development continues, and good luck with your range fuel mixes, I have included my archived database of fuel performance below, (Table 3). I hope this article goes some way to helping you in your quest for the best range/speed fuel for Classic B. 70 Laps at 100 MPH! ; Ron Lucas Aeromodeller 1972 ?